Euston Station was opened in 1837 and it suffered several reconstructions over the years, becoming one of the most modern railway stations in London. Nowadays it is being managed by Network Rail. Its main features are modern architecture, central location and excellent service. If you came to London with the purpose of also doing some shopping sessions, Euston Station is a great area, being situated near important markets and stores. Foyles St Pancras International (St Pancras International, Pancras Road, London NW1 2QP) is a special bookstore that has been opened since the year 1906. Its wide variety of genres ranges from biography to sport and travel. Sourced Market (St Pancras International, King’s Cross, London NW1 2QP) offers you fresh products and beverages seven days a week. Waterstone’s – Gower Street (82 Gower Street, Bloomsbury, London WC1E 6EQ) has more than 300 stores, but the most famous ones are related to bestselling books and authors. Between the shopping sessions, you can stop and grab a bite in one of the many restaurants situated near Euston Station. Some examples are: Pasta Plus (62 Eversholt Street, King’s Cross, London NW1 1DA) that is closed on Mondays and Sundays, Great Nepalese that presents a Nepalese cuisine (48 Eversholt Street, King’s Cross, London NW1 1DA) and Ravi Shankar (133 Drummond Street, NW1 2HL) with its Indian dishes. 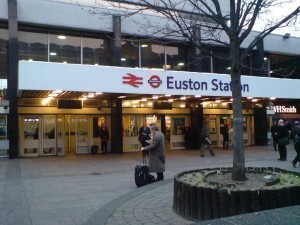 In the Euston Station area, there are also a number of important schools and education centers. The Bartlett School of Architecture (Wates House, 22 Gordon Street, WC1H 0QB) is part of University College London’s global faculty of the built environment, known for Bartlett Summer Show event that is held every year by students. The Place (17 Duke’s Road, Bloomsbury, London WC1H 9PY) is a contemporary dance school that offers classes for all ages, ranging from 5 year olds and adult amateurs to professionals. Slade School of Fine Art (UCL University, Gower Street, WC1E 6BT) is one of the best in the world in the art domain. The admission criteria are very strict and limited to talented students. In order to get rail transport from London Luton Airport to Euston Station, you will need to take the Luton Airport Bus line 888 (that comes every 10 minutes) and then the train from Luton Airport Parkway (every 30 minutes). Also, you can choose the Luton Airport Bus (every 20 minutes) and then take the one from Baker Street that arrives every five minutes. The total journey would take about 35 minutes with the train and 1 hour and 8 minutes by bus. So as to travel by car from London Luton Airport to Euston Station, you must take the M1. Luton Airport is 32.4 miles away from Euston Station. A transfer from Luton Airport to Euston Station with 247 Luton Airport Transfer is going to cost you 52 GBP for a saloon car. The journey with the Luton Transfer will last almost 1 hour and 6 minutes.